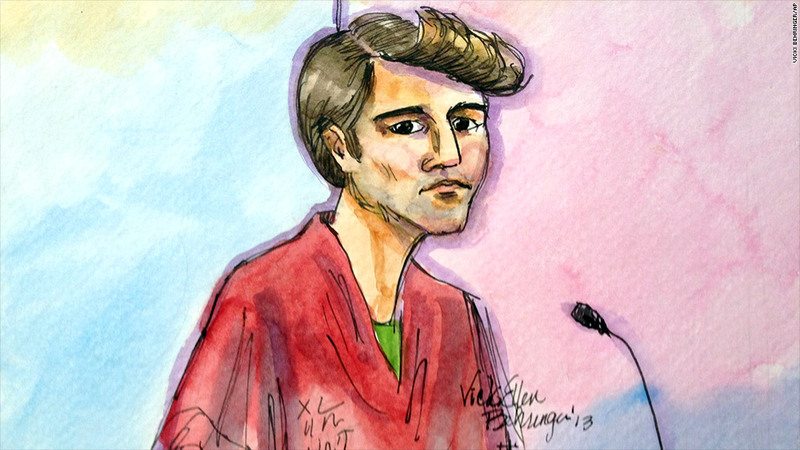 A court artist's sketch depicts Ross Ulbricht appearing in San Francisco federal court in October. Federal officials announced a grand jury indictment Tuesday of 29-year-old Ross Ulbricht, the man accused of creating online drug marketplace Silk Road. Ulbricht, who remains in custody after being arrested back in October, could be behind bars for the rest of his life. He is charged with engaging in a continuing criminal enterprise, computer hacking, money laundering, and operating a narcotics conspiracy. Silk Road, which was shut down by law enforcement officials last year, had been the go-to black market for anonymous purchases of all sorts of illegal products and services since its 2011 inception. As of September, the site had nearly 13,000 listings for drugs including heroin, cocaine and LSD, prosecutors say. The only money accepted on Silk Road was the digital currency Bitcoin, which was meant to add an additional layer of anonymity to buyers and sellers. Ulbricht, allegedly known by the online moniker "Dread Pirate Roberts," is accused of earning tens of millions of dollars in commissions from the site. Prosecutors say he commissioned six murders-for-hire while operating the business, though there is no evidence that these murders were carried out. Three men Ulbricht allegedly paid to help operate Silk Road were arrested in December. Defense lawyer Joshua Dratel said Tuesday that Ulbricht plans to plead not guilty.